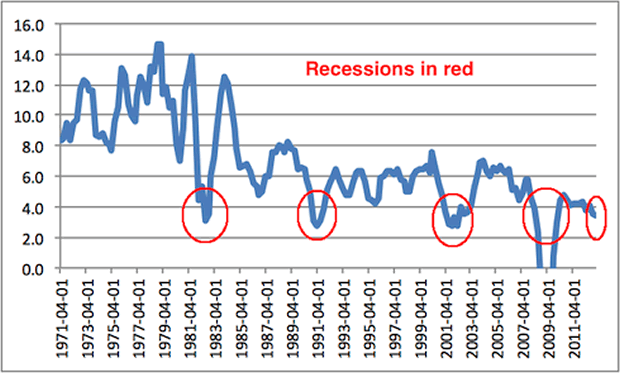 If the U.S. Economy is Recovering… Why Is Nominal GDP in a Recession? The financial world is abuzz with the unexpected jump higher in our manufacturing and non-ISM(s). The world seems to think these two jumps are the result of the US economy suddenly getting back on track. The whole thing smacks of political games. Is it really coincidence that the scandal-ridden Obama administration suddenly decided to focus on the economy (again) and the official economic data starts improving the next week? Or is this an attempt to draw attention from the fact that even the mainstream financial media has caught on that the US’s employment, GDP, and inflation numbers are a joke (hence the sudden importance of ISM and non-manufacturing ISM data)? Regardless, we cannot help but wonder where this incredible growth is occurring. Most of the growth in corporate profits over the last year have come from financials which are notorious for generating “earnings” through various accounting gimmicks. Indeed, when you remove financials from the picture, earnings for the S&P 500 are DOWN 2.9% for the second quarter of 2013. We also see that when you remove the Fed’s absurd GDP “deflator” (the way in which it accounts for inflation in its GDP numbers) that the US is clearly back in recession. So, somehow the US economy is roaring back in a big way? Hard to see. Over 70% of the economy is consumer spending. And spending is driven by incomes. 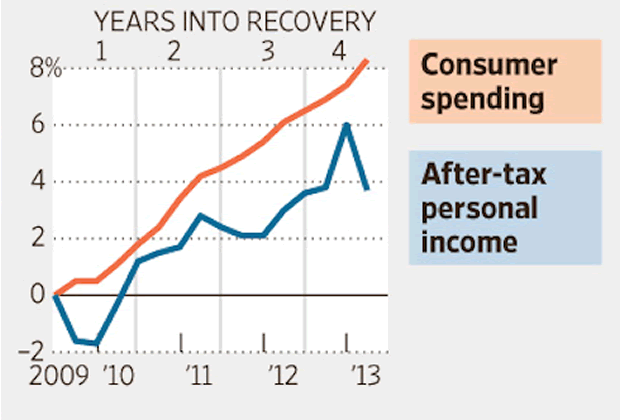 And incomes are… falling. The Great Crisis, the one to which 2008 was just a warm up, is approaching. The time to prepare for it is BEFORE the US stock market bubble bursts.